What does it mean for an object to have an electric charge? Give an example of an object receiving an electric charge, and describe how that charged object might behave. For an object to be electrically charged, it must have either a surplus or a deficit of electrons among its atoms. A common example of electrically charging objects is rubbing latex balloons against wool clothing, or brushing your hair with a plastic comb. The consequences of these electric charges are very easy to perceive! This question naturally leads to a discussion on atomic theory. Encourage your students to discuss and explore simple models of the atom, and how they serve to explain electricity in terms of electron placement and motion. How many electrons are contained in one coulomb of charge? There are 6.25 ×1018 electrons in one coulomb of charge. What would this appear as without the use of scientific notation? Write this same figure using the most appropriate metric prefix. A little math review here: using scientific notation to denote very large (or very small) numbers. What is happening when two objects are rubbed together and static electricity results? When certain combinations of materials are rubbed together, the rubbing action transfer electrons from the atoms of one material to the atoms of the other. This imbalance of electrons leaves the former material with a positive charge and the latter with a negative charge. The terms "positive" and "negative" seem backward in relation to the modern concept of electrons as charge carriers. Be sure to discuss the historical aspect of this terminology (Benjamin Franklin's conjecture), and the subsequent designation of an electron's individual charge as "negative." How many electrons are there in 2 ×10-5 coulombs of charge? Determine the answer without using a calculator, and express the answer in scientific notation! There are approximately 1.25 ×1014 electrons in this quantity of charge. One of the benefits of using scientific notation is that it allows us to easily perform multiplication and division using very large and very small numbers. This mechanical work becomes ßtored" in the electric field between the charges, and is a form of potential energy. This, again, is similar to a mechanical spring, where the work done in compressing a spring is ßtored" as potential energy in its compressed state. Define voltage in terms of the change in potential energy resulting from this forceful motion of the charge, the way a physicist would. Follow-up question: explain why, if a charge of twice the magnitude (2q) were moved from the same point A to the same point B, there would be twice as much work done and twice as much potential energy stored, but exactly the same voltage (potential) as gained by the smaller charge (q). If time permits, it is quite enlightening for students to discover that voltage may be defined in simple mechanical terms of repulsion and work. Of course, a basic familiarity with work in the scientific sense of the term is a prerequisite for understanding this scenario. A co-worker of mine was once installing sheet-styrofoam insulation in the walls of his new garage. The sheets of insulation came wrapped together in bundles for easy transport and storage. One side of each sheet was covered in aluminum foil. This acted as a reflective surface for infra-red (heat) radiation, and improved the effectiveness of the insulating panel. It also happened to function as a conductor of electricity, much to the dismay of my friend. My friend found that the sheets were physically stuck together by the force of static electric charges when they were delivered to his house. Upon trying to pry two of them apart from each other, he received a surprisingly large electric shock from touching the aluminum foil surfaces of the respective panels! Explain how the physical work he did in separating the panels from each other became manifest as voltage, based on your knowledge of voltage, work, and electric charges. Voltage is defined as work per unit charge, which tells us that this fellow's physical work of separating the attractive charges became translated into electrical voltage, which shocked him when the magnitude became great enough. By the way, this is an absolutely true story! This scenario could be easily replicated on a dry (low-humidity) day, with two large sheets of styrofoam insulation and a brave person pulling them apart! Lightning is a spectacular example of naturally-generated static electricity. Explain how the vast static electric charges that cause lightning are formed by natural processes, and how those processes relate to the function of a device called a Van de Graaff generator. The static electric charges that cause lightning are generated by the action of wind and rain transporting electrons between clouds and earth, or between clouds. Particles of dust may also transport electrons in the same manner, which accounts for the spectacular discharges of lightning often seen during massive uprisings of dust, such as during volcanic eruptions. In a similar manner, a Van de Graaff generator moves electrons from one point to another on a moving loop of fabric: a sort of conveyor belt for electrons. Lighting provides a universal example of static electricity on a grand scale. The sheer awe of lightning is itself an attention-grabbing factor making it all the more appropriate for classroom discussion. When students' collective attention and imagination are enthralled by fascinating subjects, learning is enhanced! It goes without saying that the presence of a Van de Graaff generator in the laboratory is an excellent enhancement for this topic, as well. When a large enough static electric charge is applied between the two wires of the neon bulb, the neon gas inside will ïonize" and produce a colored flash of light. Experiment with generating your own static electricity and then making the bulb flash. Hint: it may be easier to see the bulb's flash if the room is dark. What conditions produce the brightest flash from the bulb? What materials and techniques work best for producing strong static electric charges? This is definitely a question best answered by direct experimentation! If it is difficult for students to obtain neon bulbs in your area, it might be a good idea to provide a few bulbs to experiment with when you give your students this worksheet. They are quite inexpensive and durable little devices. 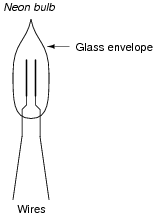 If a neon bulb is used as a visual indicator of static electricity, it will be noticed that only one of the two metal electrodes inside the glass envelope glows upon discharge. Why is this? Why don't both electrodes glow? Remember that static electricity is an imbalance of electric charge between two objects. This imbalance has a definite polarity: one object is positive while the other is negative. This means that electrons rush in one direction when the two objects discharge through the path created by the neon gas inside the lamp. This unidirectional rush of electrons makes only one of the electrodes glow. Of course, students will want to know: which type of charge makes the electrode glow, positive or negative? Don't just give them the answer, but challenge them to devise an experiment whereby they could tell for certain which pole of the charge creates a glow. The answer to this question may have to wait until they learn about DC voltage sources like batteries, where the polarity of the voltage is known. However, even if they are yet unaware of DC voltage sources, it is a good exercise to have them imagine how they might test the polarity indication of a neon bulb (perhaps by postulating a source of static charge where the polarity is already known).